With the PPA200BT, you can count on what many suitcase-style PA systems promise: two speakers, a mixer, an amp, a mic and cables. But unlike run-of-the-mill systems, Behringer packs a whole lot of power and possibility into this suitcase. You'll get inputs for four microphones and two instruments, 2000 watts of amplification, and two speakers, each sporting a 10" heavy-duty woofer and a 1.35" aluminum compression driver. Plus, a subwoofer output for easy connection to a powered sub will give you an impressive jump in impact when needed. When you're organizing a school event, running a wedding, or playing a last-minute gig, there are always surprises you just can't anticipate. 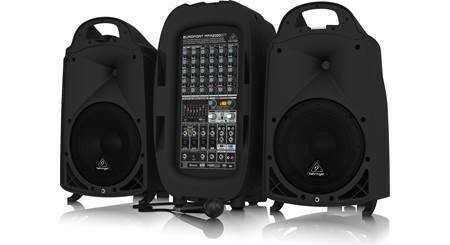 The best tactic is to be ready for anything, and that's exactly what Behringer was thinking when they designed the PPA200BT portable 8-channel PA system. 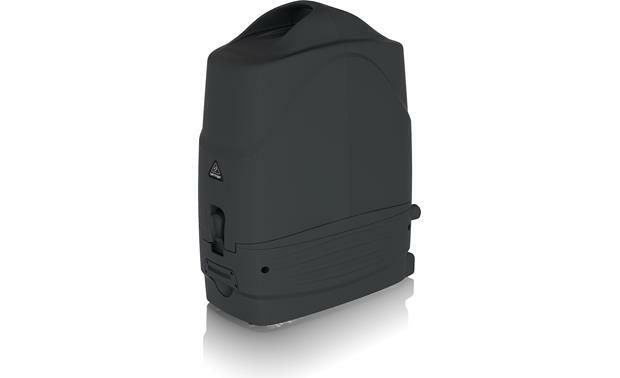 This smart and compact all-in-one unit clips together for easy transport. 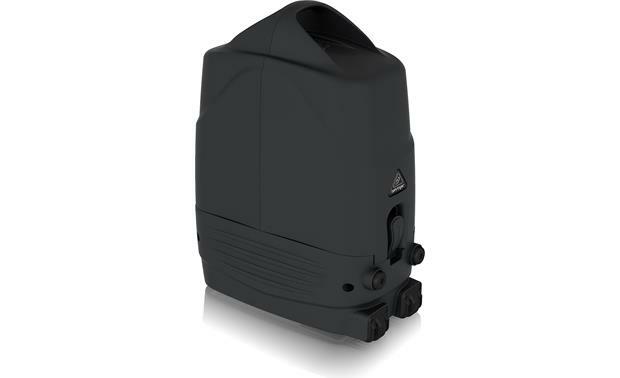 A built-in storage compartment holds the included microphone and connection cables so that set-up and breakdown is a breeze — an added bonus in the all-hands-on-deck environment of churches, busy nightclubs, and schools. In an effort to build a system for pros and laymen alike, Behringer has added a number of conveniences for real-world use. 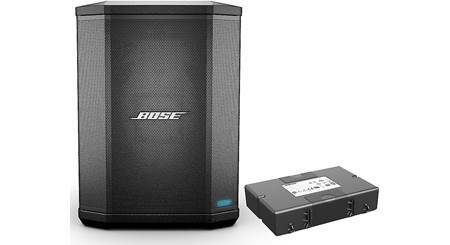 The PPA200BT is Bluetooth-equipped so you can stream audio from compatible devices. It also sports an automatic feedback detection system that suppresses squeals, howls, and squawks — a real life-saver if you're running an event that's heavy on the mic-passing. If you're planning on using Behringer's wireless mic system (not included), that system's dongle connects directly with the PPA200BT, another easy set-up feature. Need a little special sauce on your presentation or performance? The PPA200BT comes preloaded with effects like reverb, echo, chorus, and more, thanks to its built-in KLARK TEKNIK effects processor with 100 presets. 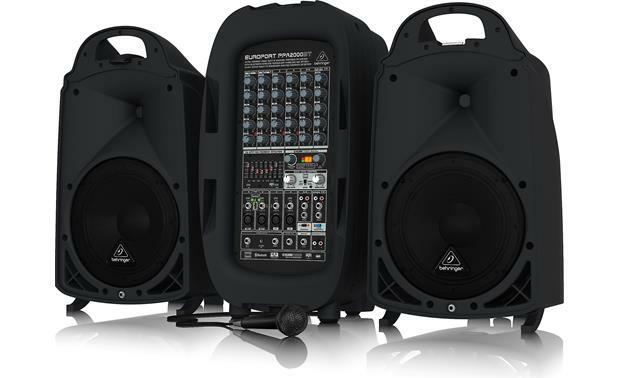 Backed by a 3-year warranty, this portable PA system is a serious value to boot. 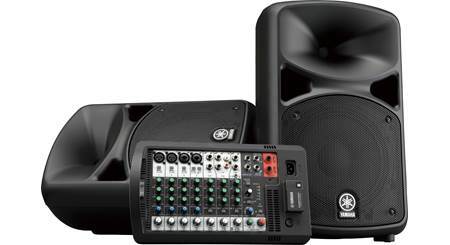 This Behringer PA system worked better then we had expected, quality sound, easy to learn and use. 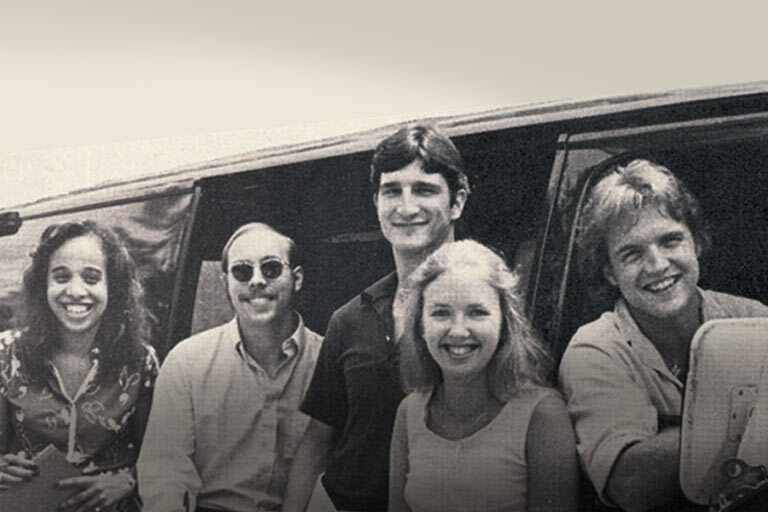 Even at top volume it never missed a beat. 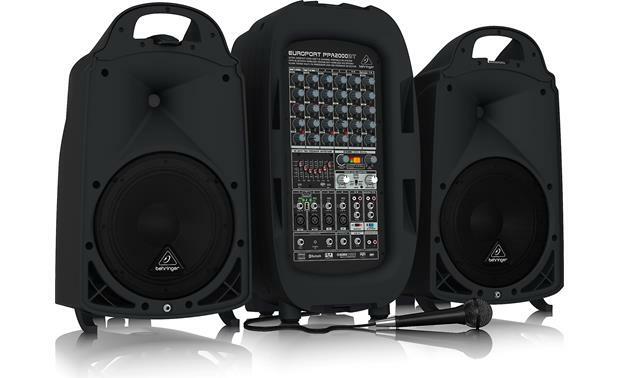 Overview: The Behringer PPA2000BT is a compact, 8-channel, 2000 watt, portable PA system suited for schools, corporate and educational presentations, small to medium venue performances, weddings and tour guides. Designed as an all-in-one system with "suitcase" style portability, it features a powered mixer along with 2 speakers that snap together for easy transport. The 8-channel mixer section is comprised of 4 mono and 2 stereo channels, but also includes a stereo auxiliary input and Bluetooth connectivity for music playback. Along with 2 bands of EQ per channel, there's a 7-band Master EQ featuring Behringer's proprietary Feedback Detection system, a high-quality Klark Teknik FX processor with 100 presets, +48V phantom power on the 4 mono channels, a Sub Out for running an optional powered subwoofer (sold separately), and 1000 watts of power available for each of the two detachable speakers. Recording Out: A set of stereo RCAs are provided to output the main signal to an external recorder or another mixer. FX Footswitch: A 1/4" TS footswitch jack lets you cycle through the different FX in the FX section with an appropriate footswitch (sold separately). Sub Out: This is a 1/4" TS jack that outputs a mono version of the main signal, for running to an optional subwoofer (sold separately). Stereo Aux In: This section has an 1/8" stereo jack along with Left (mono)/Right 1/4" TS inputs for running an external music source through the mixer. 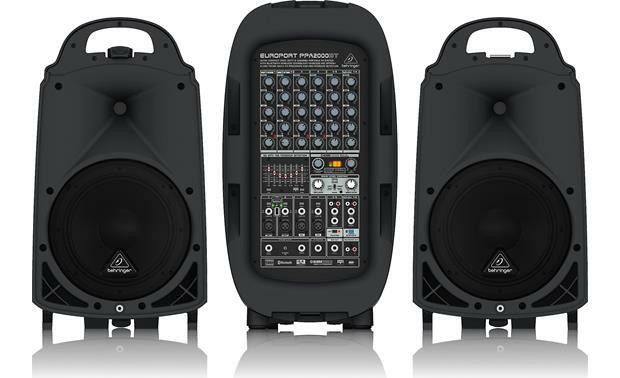 Chassis: Housed in tough molded-plastic enclosures, both the powered mixer and the speakers are designed for portability and durability. Each speaker contains a 10" woofer and a 1.35" aluminum-diaphragm compression driver and is designed to snap together with the mixer for transport. A pair of wheels are attached to the bottom of the powered mixer to make portability easier. Equalizer: The PPA2000BT features a 7-band EQ that gets applied to the Main output signal. Bands include: 63, 160, 400, 1k, 2.5k, 6.3k, and 16k with +/- 12 dB of adjustment for each band. The EQ section also incorporates Behringer's FBQ (Feedback Detection) circuitry. If feedback is detected in a specific frequency range, the LED on the associated EQ fader illuminates, showing you which fader to lower to overcome the feedback. Multi-FX: A studio-grade effects processor is included in the PPA2000BT, with 100 presets that include Reverb, Delay, Chorus, Flanger, Pitch-Shifting, and many more. These effects are custom-engineered by Klark Teknik, recognized worldwide as one of the most prestigious British audio companies, and are all 24-bit, professional grade effect algorithms. The Effects section includes a Program dial to cycle through and select an effect, along with an FX Level dial which acts as a master FX level for all channels. A 2-character display shows the Effect number and 2 LEDs are provided to show Signal present and Clipping for the Effects section. Bluetooth: The PPA2000BT incorporates Bluetooth technology (supports A2DP 1.2 profiles / spec 3.0 compliant) for music streaming from a Bluetooth enabled phone, tablet, or laptop. The rear-panel has a Pairing button along with a Bluetooth status LED that will blink during the pairing process and go solid once a Bluetooth connection has been established. Bluetooth signals are processed through input channel 7/8. Microphone: A Behringer XM1800S wired microphone is included with the PPA2000BT, along with a 20.5' mic cable. This is a dynamic mic with a cardioid polar pattern, making it ideal for vocals, and includes a built-in on/off switch. If an optional wireless mic is preferred, the mixer includes a USB port that supports Behringer's Ultralink wireless technology, allowing one of their ULM series wireless mics to be used, such as the ULM300USB (sold separately). The USB dongle that comes with the wireless mic plugs into the USB port on the mixer and connects with the mic almost instantly for an easy wireless setup. 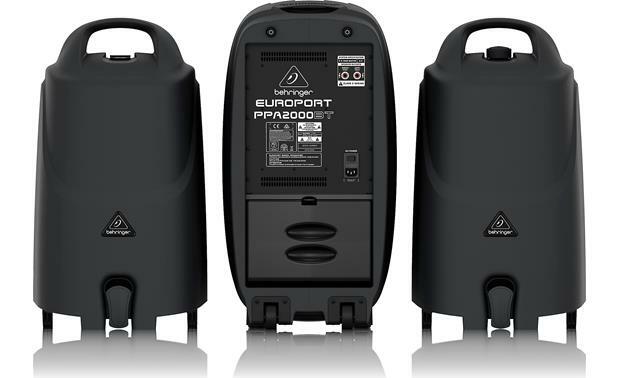 Dimensions: Width - 25.90", Height - 33.25", Depth - 13.90"
Can you use monitors with the Behringer Europort PPA2000BT? Yes, the Behringer PPA2000BT does include a set of RCA outputs to connect an external set of monitors. 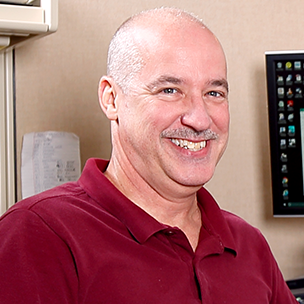 For more details or to discuss further, please feel free to contact one of our Pro Audio Advisors directly by phone (800.555.9369) or online chat. Thanks! Searches related to the Behringer PPA2000BT Portable 8-channel PA system.